So maybe you’re out car shopping and you’ve used TrueCar to help you find a good to great starting price point for the car you want. If you’re unfamiliar with how TrueCar works here is a great article that goes a little more in depth. What some people have realized is that TrueCar is a great bargaining tool or chip to take to competing dealers to see if the dealer is willing to beat the recommended price set by TrueCar. Some people either call or visit non TrueCar certified dealers asking to match or get a lower price. It’s no surprise that several of these dealers are happy to match or go lower than the TrueCar offer, especially because they don’t have to pay TrueCar the $299-399 commission per sale. So how does Price Setter make this simpler? Once you’ve obtained a TrueCar certificate you can take your certificate to pricesetter.net and use the Price Setter tool to engage car dealers and get a better price. How does this work? 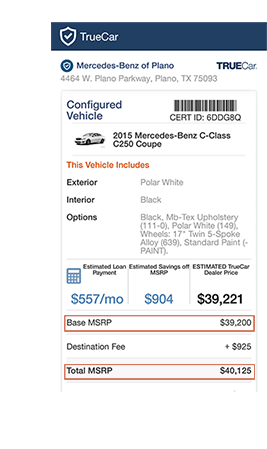 When you get a TrueCar certificate on the car you want to buy the certificate will display the estimated TrueCar Dealer Price and the Total MSRP. You can plug these numbers into the Price Setter tool do calculate percentage under MSRP. This percentage under MSRP is what Price Setter dealers are going to compete against on the same vehicle. The vehicle has to be the same make, model, and trim, otherwise you’re not comparing “apples to apples”. You must also be sure to include an uploaded picture or screenshot of your TrueCar certificate to Price Setter so that the winning Price Setter dealer can verify the price to beat amount and legitimize the counter offer to lock in your savings. After that, you take your Price Setter confirmation number for this deal to the winning dealer for honoring. What this solves: you no longer have to call around or drive around to see which dealer will meet or beat your price. You can engage all dealers through the Price Setter cloud and have them compete for you, and get this done in REAL TIME. You get a better deal!